USA 186 is on the move. Can I ask a question how is it an on orbit image video of USA 186 can be hosted on You Tube without the NRO asking for it to be taken down? Not going to post the link here. I hope they wouldn't ask. If so, then I would be seriously bummed if YouTube complied. It is something that anyone with a telescope and some initiative can see. If an amateur can document it at this resolution, imagine what a State entity with substantial resources can see. The secret isn't the box, it is what is inside the box, how the box is used, etc. Thanks Ed for the good explanation. TBH I know from stuff I’ve read that high end amateur astronomy equipment these days has an extremely high performance but I didn’t think that would apply equally to fast moving targets like satellites, being as obviously it’s not something astronomy magazines generally cover. It is an amazing progress in technology from when I worked on one of the first computer controlled telescopes in the early-mid 1970's. You don't even need to track. You can point at the location the satellite is going to pass and take a high framerate video. Are we talking about just a point of light though? I doubt that would be successful. I have heard that there is discussion of declassifying the early KH-11 program. But I've heard that for a few years now. And it's always easier for somebody to say no than to say yes. I should add that I have written a lengthy (~20,000 words?) article about the decision to build the KH-11 KENNEN. I'll probably start publishing that in parts on TSR in the next few months and then get the whole thing into print. It is mostly about the decision-making, not about the technology or the actual spacecraft that flew in late 1976. How much does the present government administration in the US at any particular time impact the decision making process on declassifying projects? Astronomy equipment is not optimized for the task, so tracking mounts are usually too slow. 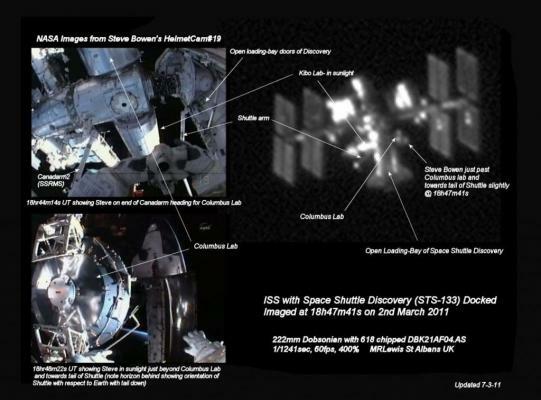 Manual tracking is used to photograph satellites. Quality can be good enough to see an astronaut on a spacewalk. I've seen several of these efforts on astronomy websites. Depends on the equipment. The Paramount MX+ we have can track even very fast moving objects. This article hasn’t been posted previously. So, there is something new under the sun, in more than one way. While the general consensus still is that USA 290 is an electro-optical bird in the ADVANCED CRYSTAL lineage, the radical break with previous orbital structures for this series of satellites is highly interesting. It will be interesting to follow this new object, and see how things develop with future launches. The non-sun-sync nature of the orbit seems to suggest that something other than visible spectrum may be at play here. I know there's quite a bit of atmospheric attenuation, but infrared maybe?